Janie was first introduced to yoga over 20 years ago after the birth of her son Christian. In the beginning, those VHS videos were just a way to help lose the “baby weight”. She would try to follow along the best she could while her son crawled back and forth and over and under her downward facing dog. She quickly learned that there is so much to yoga than the physical effects on the body. She was actually able to de-stress and it began to carry over into her life even after the videos were over. Eleven years later Janie and her son moved to New York from Virginia and she finally took her first real yoga class. Midway through the class she fell over attempting a posture with a “bind”. She felt humiliated and embarrassed until the teacher said, “falling is always an option, just slow down, take a deep breath and try again”. So she did and not just in that class, but in her life. Several years later, Janie realized that she really wanted to be able to share with people the benefits of yoga. She had also found a new passion with aerial silks and hammock. 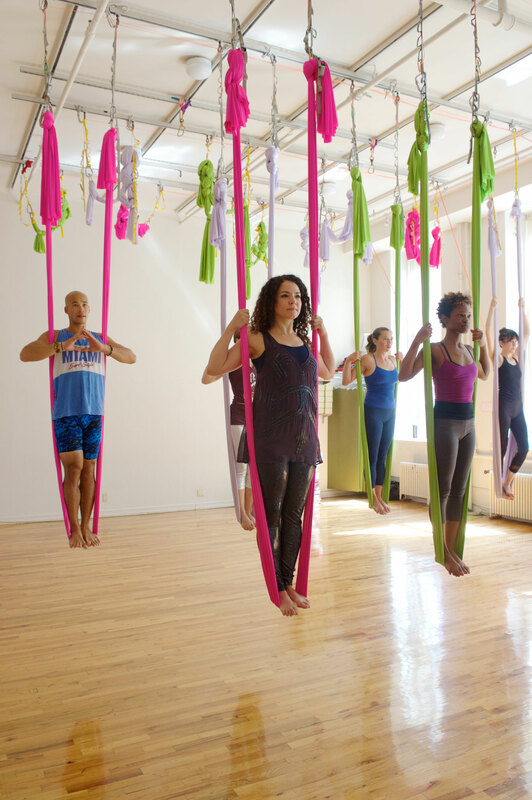 Janie completed OFSY's 200-Hour Teacher Training and 50-Hour Aerial Yoga Teacher Training. She loves to help people work through fear, finding physical and emotional strength through creative and safe movement. She invites her students to give her requests, take up space, have a voice and find their own creative expression.